View the Startup Message Log. Start up and shut down the MySQL instance. View the current status of the MySQL instance. With a valid connection established, and the connection tab for it open, you can access the control actions from either the Navigator panel or by clicking Server and then Startup/Shutdown from the menu. 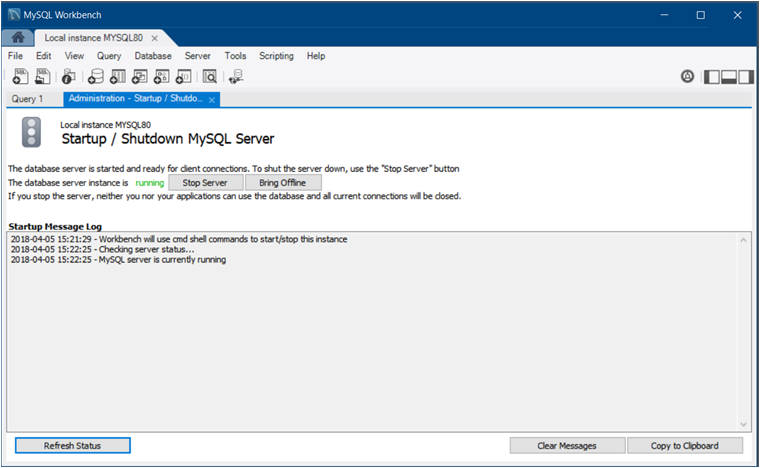 The following figure shows an example of the Administration - Startup / Shutdown tab with the database server instance running and the Stop Server and Bring Offline buttons displayed.